The RG-RSR77-XSeries Core Integrated Services Routers are Ruijie’s innovative next-generation high-end multicore distributed routers for the enterprise network cloud infrastructure and cloud services. Based on Ruijie’s Network Simplicity Solution and the development trend of mobile broadband networking, the overall performance of the RG-RSR77-XSeries providing strong support for the existing network requirements and high scalability for business development for the coming 5-10 years. The routing engine, fabric engine and module card of RG-RSR77-X Series are physically isolated which has achieved separate management, control and data forwarding in the high-performance multicore platform and distributed architecture. The RG-RSR77-X Series is the first to adopt dual data plane to improve performance while ensuring uninterrupted services. 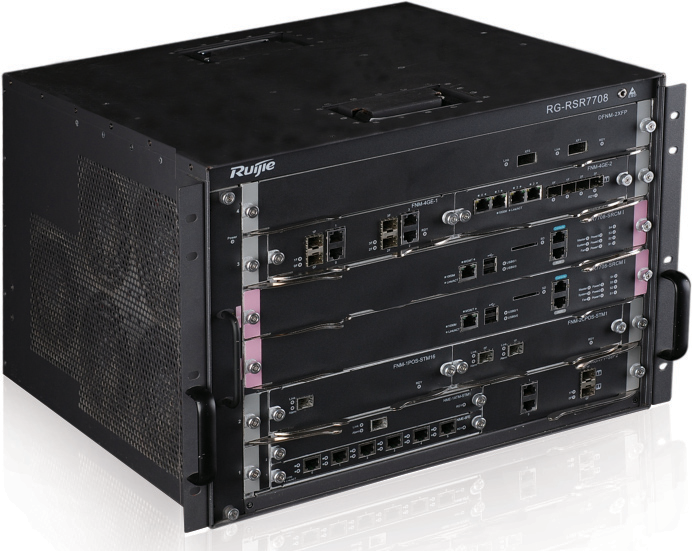 With Ruijie’s advanced RGOS (Ruijie General Operating System), the RG-RSR77-X Series fully support multiservice VCPU, REF and X-Flow while continuing to enhance the multiservice concurrent processing capability. The distributed line card supports multiple interfaces and built-in full service features which integrates technologies such as NAT, IPFIX, IPv6, BGP, IPsec, MPLS VPN, H-QoS and multicasting. The RG-RSR77-X Series is high-end IP core router, mainly deployed in the WAN network core, aggregation nodes, large campus network gateway and edge aggregation of various kinds of data centers in government, finance, network operators, education, medium and large-sized enterprises. RSR77-SIP1 – FNM service interface card, with 512M Memory, 2 FNM service interface card slots. Can support encryption performance of up to 20Gbps for IPsec VPN. Supports targeted security access control from the link layer to the application layer for MAC address, VLAN, URL, etc. IPv6 routing technologies, such as static routing, equivalent routing, policy routing, OSPFv3, RIPng, BGP4+, IS-ISv6, ICMPv6, ICMPv6 redirection, ACL for IPv6,TCP/UDP for IPv6, QoS for IPv6 and IPv6 multicast.